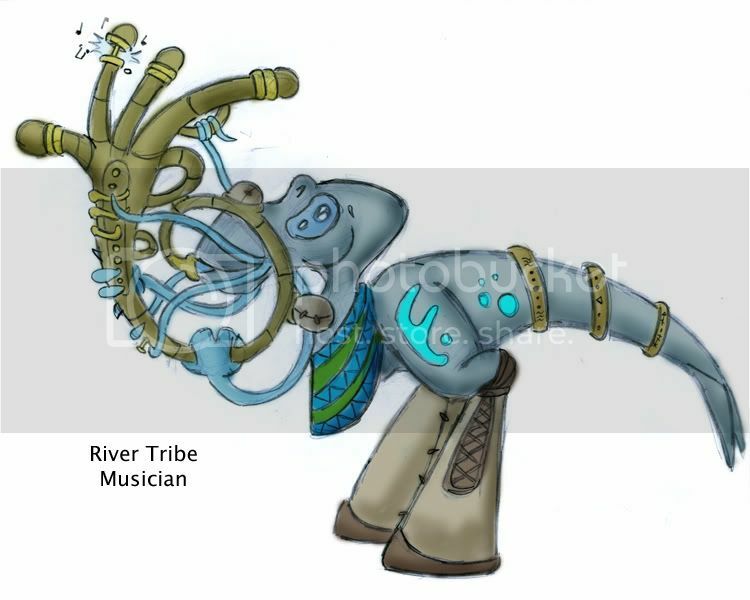 Is there any reason the River tribe builds their home on stilts, are the rivers prone to flooding or just some artistic license? For the ocean tribe the breathing tube doesn't look like it fits very far out of the water. If this is the case couldn't water enter during a storm, or worse even be snapped off. On the other hand this might be a giant structure, and the breathing tube might be quite far out of the water. Maybe adding measurements or a little Naucean beside the picture to show scale. Finally I'm not up on my scientific classifications. I was thinking the differences might be too great for them to possibly be of the same species after a brief search I found that it all depends if the different races can breed with each other. If they can they are all subspecies, if not they are all a different species. The basket house is up on stilts because if it were on the ground it would wash away. The river area they live in is full of rushing rivers. 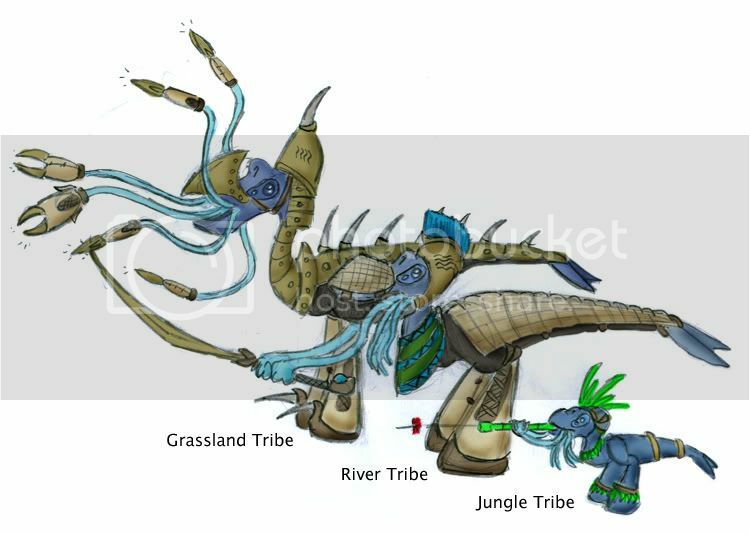 Also its shape is to look diffrent from say humans also its to resemble the ocean tribe since they were the first tribe to evolve and all split from it. As for the ocean tribes breathing tube i would agree. I was not sure if i should have it where they collect sacs of air from the outside or just have a tube. There is no real good explanation other than if it were to tall it would snap off anywho from the waves. It also is adjustable. For the diffrent tribes they are no more diverse than Earth's diffrent dog breeds. Who could imagine a chihuahua, pug, st Bernard, poodle, husky, bulldog and collie are all the same species of domesticated wolf. Yes dogs can still reproduce with wolves just as well. My primitive ocean Nauceans are just like a wolf. And the rest are like varied breeds. Coyotes, foxes, African wild dogs, jackals, dholes and other canines all seem like they could be subspecies of wolf but they are not. The fact is in dog breeds despite their diffrent appearances they are still the same species. And despite the similarities between say a coyote and a wolf they are not the same species. Here are just 3 warriors from 3 different tribes, River Tribe, Jungle Tribe and Grassland Tribe. I have already explained the River tribe warrior so i will not go over it again. Jungle tribe are very small and live in the jungle canopy. These are blowgunner warriors who peak out of the leaves and ambush enemy's. They also double as hunters. They live in the stone age still. They wear green headdresses which also blend into the leaves as well as tradition. They may be small but they can swing fast though the trees by their tentacles to either ambush with poison darts from their blow guns or will jump on the back of the larger Naucean tribes warriors back. The Grassland tribe are one of the most land based tribes. They do not swim in battle if they can help it. This is because they are heavily armored with bronze plating with spiked horns. They also have punching daggers like the ones described before.Their tactinc is to get close enough to puncture and are armored enough to protect themselves. Their punching daggers are no match for the River tribes padded armor or the Jungle tribes lack of armor. Sadly this make them slow when walking. Which is a shame since without armor their speed is much faster with their long legs. They also tower over all but the ocean Nauceans. And even then the ocean Nauceans do not come on land. Thus are not really a threat. Like the River tribe they also wear "leather floots" except they have the clawed spikes on the front for kicking action. One kick to a Jungle tribe warrior with this weapon and they are dead. The other major players on land would be the swamp tribe, desert tribe and mountain tribe (since the ocean tribe will not travel on land and the cave tribe are almost never seen above ground. Whao. Very thorough. This has inspired me to make a/some creature(s). Great job. Sadly, I'm not good at coming up with names. ah kewl thats inspired by that huge forest walking cuttlefish in The Future Is Wild, right?, I forget the name of it though. The evolution tree is cool but it would be easier to understand if you joined up the pictures with lines instead of just using little arrows. I know I'm late here, but I wouldn't bother with Gmax, unless you are building models for mods or level design. I would move straight to http://www.alias.com/glb/eng/products-services/product_details.jsp?productId=1900003 for the Maya Personal Learning Edition. This program blows every other free program out of the water, because it is the absolute full version...for free. The only drawback is when you render an image, there is a watermark on it. I'm sure nobody has mentioned any illegal methods here, so I won't as well. But I will say, in all honesty, the majority of CGI work out there by hobbyists is from illegal copies of the software. As long as you aren't making money, companies like Alias and Discreet know there are tons of people using and learning on their product. When you start making money, then you own it to them to purchase the full licensed copy. *First thing you want to do is use bump mapping on the creatures skin. An easy way to do this is use the same texture you used for the diffuse, and drop it into the bump slot (in max). The key here is to not use too much bump, and to make sure your repetition of the bump map is set to the same as the diffuse map. *As for the ground he is standing on, you are using a large stone texture, which wouldn't really benefit from bump mapping unless is was extreme, so don't even go there. I would use...bah, nevermind. Just don't use huge 2D stones in the same scene your sporting 3D unless you bump it, or use actual geometry to showcase earth/stone. *Use a three point lighting rig to showcase the objects. Make sure only one of them is using diffuse shadows. Go to this link -- http://www.3drender.com/light/3point.html for a nice and easy tutorial for a three-point lighting rig. Wow that's great! Thanks. I still perfer 3DS Max over Maya , but i think sicne it is free and all i will download it anywho. I have tried both in school and just found 3DS Max to be the one i cought on to quicker. I tell ya if i find it in the game i will give up and bring itback to my creatures home planet to let it colonise. its so god damned good.